One of Hollywood's hottest screenwriters, Christina Hodson, has been chosen to write the Margot Robbie-produced "Harley Quinn/Birds of Prey" feature film at Warner Bros. In four short years, Hodson has had three of the hottest unproduced scripts on the Black List, selling one and writing a reboot of "The Fugitive" also for Warner Bros. She's written "Bumblebee," a spin-off of the smash hit 'Transformers' franchise, and is now looking for a director. As for Robbie, she's hot off the success of 'Suicide Squad' where she played the fan-favorite Quinn except the film will not be a solo outing. 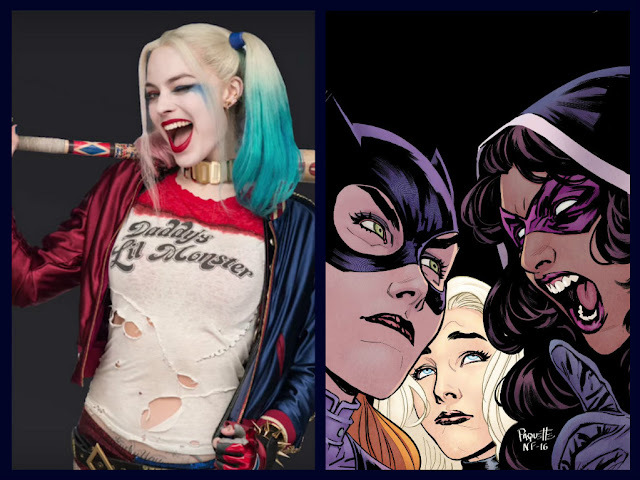 It's unclear of the dynamics at this point but the film will feature a mostly female cast of heroes and villains including Quinn, and presumably traditional "Birds of Prey" members from the comics - Batgirl, Black Canary, and the Huntress. The film could include characters like Poison Ivy, Catwoman, and others. The Wrap was first to report Hodson's hiring but no official word from Warner Bros. We'll keep you up to date as developments occur with the project. Birds of Prey Christina Hodson DC Comics Harley Quinn Margot Robbie movie screenwriter Warner Bros.
Labels: Birds of Prey Christina Hodson DC Comics Harley Quinn Margot Robbie movie screenwriter Warner Bros.